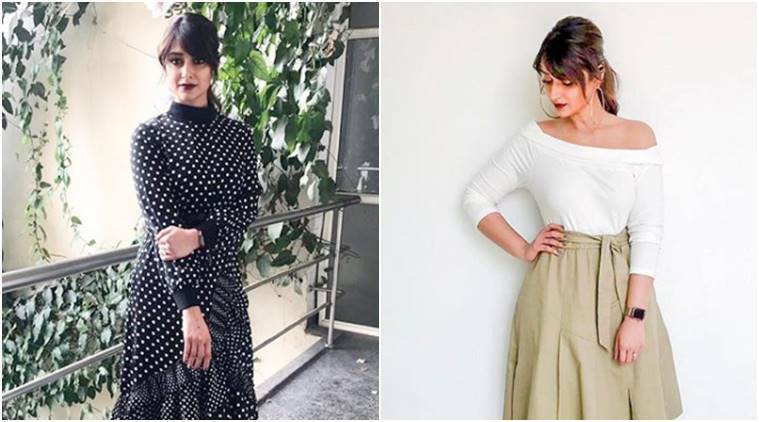 Ileana D’Cruz, who is busy with the promotions of her upcoming Telegu movie Amar Akbar Anthony was recently spotted attending different events in Madison On Peddar outfits and we must say we are impressed. Decked in a white off-shoulder top, tucked-in and teamed with a khaki tie-detailing skirt, the actor made for a pretty picture. Chic and comfortable, we think her outfit is perfect for an evening date. Although what caught our attention was the extremely oversized hoop earrings that added an interesting element to her look. Stylist Sanam Ratansi further accessorised her outfit with strappy pumps and a statement watch. For the make-up, a dewy sheen with dark red lips and hair styled in a messy ponytail rounded off her look beautifully. The Rustom actor was also seen donning a polka-dotted dress featuring high-neck, long sleeves and ruffle detailing on the skirt. While it could have been difficult to pull the fully printed outfit, D’Cruz managed to pull off with ease. Stylist Ratansi also teamed the outfit with matching polka-dotted pumps, which we think should have been avoided. Well-defined eyes and red lips gave finishing touches to her look.